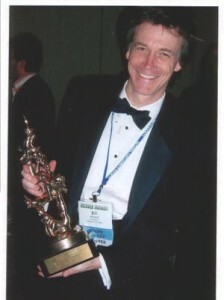 Bill Amend with his 2006 Reuben Award. Cartoonist Bill Amend started his syndicated comic strip Foxtrot in April, 1988. Foxtrot, which is distributed by Kansas City’s Andrews McMeel Universal, was featured in more than 1,000 newspapers at its peak. Beginning in December 2006, Foxtrot became a Sunday-only strip so Amend could work at a more comfortable pace. In May 2007, Amend was awarded the 2006 Rueben Award as Cartoonist of the Year by the National Cartoonists Society. Amend was born in Massachusetts and currently lives in the Kansas City area. On his website, he says, “Somewhere around fourth grade I discovered I could draw cartoons pretty well and began entertaining myself and friends with homemade comic books…. In high school I contributed cartoons to various school publications but was more interested in computers, Star Wars and Dungeons and Dragons than anything.” Amend attended Amherst College majoring in physics. At Amherst, he was editorial cartoonist for the school paper.